Clint Wynn shows off laptops given to Crossroads Academy students through the schools 1:1 program. 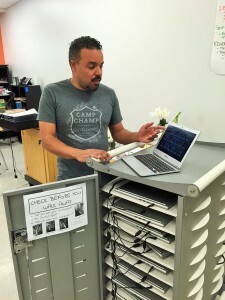 The urban K-8 charter was one of the 400-plus local public institutions to receive a free community connection from Google Fiber. That fiber line arrived in the spring of 2014. It took another year to get the school’s network built up to distribute the 1 Gbps broadband speeds throughout the building. Now the school is able to deliver blazing fast service to its 276 students, in every classroom, on every device. The network rebuild was completed in January. Meanwhile, the school also received a grant from a corporate partner to fund a 1-to-1 program, placing tablets and laptops in the hands of every student. These technological upgrades have led to what Executive Director Dean Johnson calls a “paradigm shift” in the way the school uses technology in the classroom. “It expands the capacity of teachers and allows students to be more on task because the students are working right at the teachers’ precise level,” Johnson tells KC Digital Drive. In addition to providing more powerful tools for classroom interaction, the increased speeds also open up online testing options that weren’t a possibility before. And then there’s the sea change in how a classroom functions. Clint Wynn, an IT consultant who led the network rebuild, relates it to the frustration we all feel when webpages take forever to load. With that in mind, picture a whole roomful of third graders disrupted by blank screens and loading icons. “When you have delays from click to click, it really influences their curiosity,” Wynn says. That’s not a problem anymore at Crossroads.